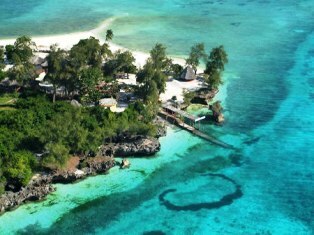 Bawe Tropical Island is the perfect setting for those escaping on a romantic breakaway. Its 15 magnificent cottages are discretely scattered along the beach line, all of them with panoramic views of the clear waters of the Indian Ocean, ensuring maximum privacy and seclusion. The cottages, situated to make them feel like a part of the surrounded landscape,are built on local traditional materials and topped with thatched roofs, allowing the invigorating sea breeze to circulate and affording cool atmosphere day and night. The spacious cottages host magnificent dhow type of beds equipped with mosquito nets. The tasteful interiors, known as los colores given their warm combination of soft colours (greens, yellows, oranges, grape fruit) are elegantly decorated and they all contain ensuite bathrooms, all with double basin, 2 al fresco showers and bathtub. Guests can relax on the private beach or by the fresh water swimming pool, basking in the sun or discover the wonderful corral gardens right in front of the lodge. Bawe Tropical Island is one of the few places in East Africa where you can go snorkeling from the beach and swim at all tides. Accommodation comprises 15 cottages discretely scattered along the beach, all with panoramic views of the clear waters of the Indian Ocean, ensuring privacy and seclusion. The deluxe rooms are ensuite with huge bath tab and shower. Each cottage is provided with a wooden deck facing the sea, covered with a romantic pergola with exotic flowers.